Edith and I joined Kathryn, the project manager, in Stirling. I had been keeping up to date with the website in the months leading up to it, so I thought I had a good idea of what to expect. However, I did not expect the sheer size of the event. It was a little spread out, and must have been a logistical nightmare to arrange. Although I had read the releases on the event, even I was not prepared for the amount of vendors that the event had attracted. There were exhibitors from the beginning of the process (spinning etc), to a great variety of wools and different types of knitting. Other exhibitors were sellers of buttons, knitting needles, beads etc and also a knitting machine club. Classes had already been arranged on a variety of subjects throughout the days of the event. On the Saturday there was an attempt to break the world record for knitting a jumper from scratch. This entailed spinning the wool from a fleece to the knitting of the jumper. Those who were involved did not break the record but it was not for the want of trying! We not only found the event interesting and useful for the project, it gave us a chance to network with others. The range of interests of the stall holders was also interesting. We shared our accommodation with knitters from Shetland, who were knitting Shetland lace. Our chats went on late into the evening, but we hardly noticed the time as they were so interesting. One of the topics we spoke about was that knitting in schools was soon to cease. How are we to pass on skills to the younger generation if it is being discouraged at every turn? I do hope this event is repeated next year, as events such as this do attract interest in knitting and associated crafts. If you haven't attended an event such as this, I would encourage you to do so - you don't know what you are missing! The setting was beautiful and the event attracted a wide range of people. The stall was extremely busy, gaining lots of interest from both knitters and non-knitters. Women, and men, of all ages attended the event, and quite a few children attended as well, which is a good omen for the future. 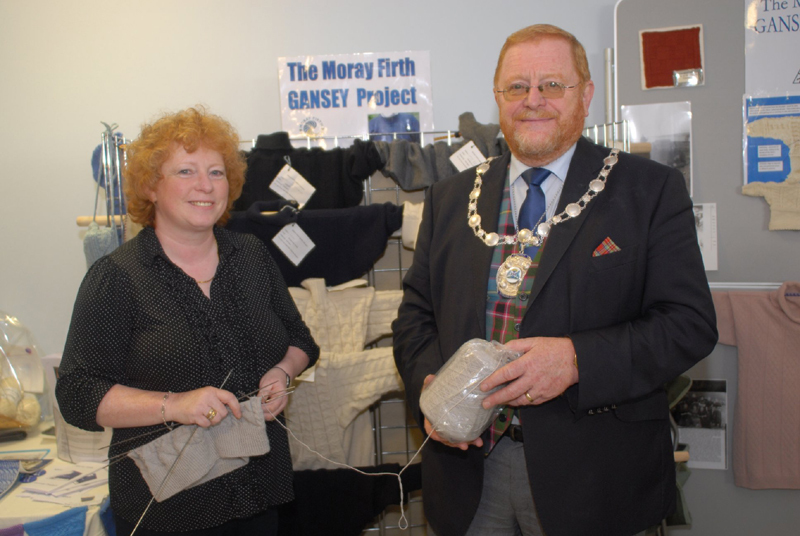 The project created much interest from knitters both in the UK and overseas. We talked to some American women who were on holiday, and who had had a visit to UK Knit Camp built into their itinerary. There were also a group of women from Sweden and Norway who had also heard about the event and had planned a visit to Stirling as part of their holiday.